*BUC Song Project Tower of Mercy (Brown) A new-ish song from Dave. It would be great to have the musicians play this. "O sweep us into your great breath of life"
*BUC Song Project Drive us out (Whelan) A spirited and lively song about being driven to new places by the Spirit. *ATAR643 Fire of prophet cool wisdom of sage / Spirit lead us (Somerville) An excellent song about knowing God through sacred stories, and being part of God's sacred story. This would be an excellent song for the entry of scriptures at the start of the service if this is your practice. It may be best sung first by a soloist. You could use it repeatedly during the Pentecost season. Sheet music & sound samples. *ATAR607 Spirit of dreaming (Campbell Rate) Good open-ended words of hope for the coming of the Spirit, and a catching soothing melody, that gets a nice twist in the chorus. Sound sample, lyrics and purchasing options. *Online Resource Set us free for Freedom (Murray) Good challenging words, and two possible tunes, which are BOTH good, but quite different. The Klusmeier tune (1st in the download) is a good folk hymn tune, while the Gibson tune (2nd in the download) is more upbeat with a rousing chorus. Lyrics and free sheet music. *Tune In Spirit of the Father, Spirit of our Mother / Alive in me Catchy boppy pop song about God's spirit within us and within the world. Music sample, sound sample and lyrics. Good for kids. Music sample, sound sample and lyrics. *SP&P034 Come and fill all my life (Bruxvoort-Colligan) A gentle and very simple song. Would be good for a meditation. *GA183 Come Holy Spirit the spirit of Wisdom (Willcock) Good song. It's in 7/8 so you can't go wrong. The words are also excellent about God-with-us and the coming of the Spirit This is also in New Song in an Ancient Land Vol 1 (in the Liturgy Library at BUC). Clunky sound sample. G(3)549 Living Spirit Holy Fire (Duck) Lovely words, and a simple flowing tune. Lyrics and melody line. Sound sample. SP&P005 Holy one may your presence here (Grundy) A joyful and quite quick chorus seeking enlightenment from the presence of Christ. *AoV1-043 Breathing now the life of God / Warm Our Hearts (Marshall) Simple round. "Breathing now the life of God the Spirit in us singing, come light up our hearts with joy! Heal and clear our eyes to see! Warm our hearts with peace. 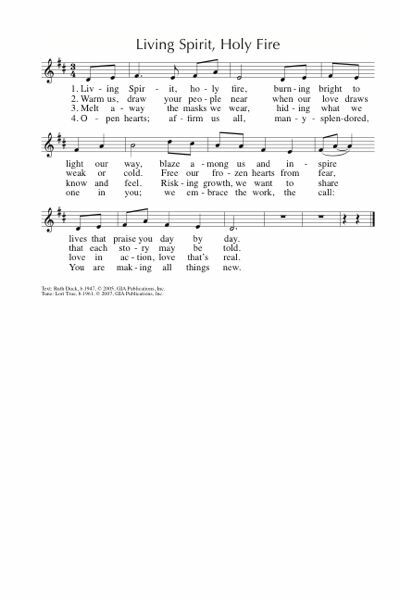 Warm our hearts with peace.” Short songs like this are great for kids. When teaching a song that breaks into a round, it’s best to work with as little accompaniment as possible; no accompaniment is best. Good for kids. *NCH287 / FFS11 Come teach us Spirit of our God (Murray/Jillian Bray) Excellent words and a good tune. NCH272 / VU195 / GtG289 / PH128 / W&R334 / Cha237 On Pentecost they gathered (Parker Huber) A simple story-telling hymn. Tune is a simple traditional tune. Lyrics. AoV2-058 Pulsing Spirit rippling river (Dufner) I've just written down in my notes that this is excellent but I can't remember why and I don't have the book this week. Lyrics. SP&P091 O Great Spirit earth sun sky and sea (Getty) A beautiful and simple meditative chant on the Spirit. This can be sung gently, or more energetically like a Native American chant, as here. ELW736 / SFFS 2060 / GtG005 God the sculptor of the mountains (Thornburg) A song full of excellent imagery. Tune will need to be taught, but won’t take long to learn. Good for congregations in times of transition. Lyrics, sound sample, and sheet music. MV141 We are all one people (Naytowhow) A simple Native American song. *URW155 / VU295 The Earth and all who breathe (Duck) Excellent words about care for creation, our role as stewards of the earth, and the struggle against destructive progress (Babel is mentioned too!). Sung to the familiar tune ICH HALTE TREULICH STILL. Lyrics and sheet music sample (different possible tune). New words to old tunes. TiS 65 Send forth your spirit O Lord and renew the face of the earth (Murray). A lovely refrain and a good paraphrase of the Psalm. The refrain doesn't really work well as a chant. The cantor part can be read if you don't have a cantor. GtG323 / URW171 Sound a mystic bamboo song / Dong dong ay si dong ilay (Wallace) Great multicultural words, celebrating God in all people. *TiS 706 / Taizé / AoV2-142 / A&M600 / SFFS 2013 / GtG544 / PH224 / GC(II)576 / G(3)620 / CP360 / PfAS103C / SP194 / Src79 / URW377 / Lau813 Bless the Lord my soul (Batastini / Taizé) A beautiful and very well known Taizé chant. Sound samples, sheet music. Good for kids. *PfAS104D Send Forth Your Spirit O Lord (Warner) Energetic hymn of praise. You could use both the verses and chorus, or only the chorus, as a Psalm refrain. *AoV2-051 / G(II)325 / GC463 / GC(II)481 / G(3)555 Spirit Blowing through Creation (Haugen) Excellent. Don't rush or it's hard to get all the words out. MV015 / GA186 Holy Sacred Spirit (Brown) Gentle chant. Can be used without the cantor part. "Holy Sacred Spirit, breathe your breath on us". Good for kids. *TiS 166 / AHB 102 / StB 35 Sing a new song sing a new song Excellent inclusive words from Australian poet James McAuley. The last verse annoys me a bit, but the rest is excellent. Lyrics. *TiS 152 / NCH4 / UMH89 / VU232 / LBW551 / ELW836 / HPP22 / GtG611 / PH464 / GC529 / GC(II)520 / G(3)614 / CP425 / W&R59 / Cha002 / URW065 / 82Hml-376 Joyful joyful we adore thee Note that this hymn is not always very inclusive. I prefer more modern translations (e.g. TiS, VU, NCH, GC(II) ). Oldy-but-a-goody Older version lyrics and tune sample. G(II)90 / GC101 / GC(II)60 / G(3)076 Lord Send Out Your Spirit (Lisicky) Could be fun to use just the refrain as a round. I would sing it much quicker than the sample. Sheet music sample. Sound sample. TiS 188 Where wide sky rolls down and touches red sand (Smith) Great Australian imagery sung to a familiar hymn tune. Lyrics (scroll down). *Tune In: Father of Earth, Mother of Sea. A latinesque song about the Spirit being with those who are victims, prisoners and the sick, as well as present in our prayers. Lyrics, sound sample, sheet music. *Taizé / TiS 747 / ATE 214 / Iona (M&G) / GtG842 / PfAS027A / URW393 The Lord is my light, my light and salvation A simple and very popular Taize chant. Note that this is really easy on recorder if you have a kid in your congregation who is learning it. Good for kids. Youtube. *TiS474 / AoV1-012 / ATE 295 / CH623 / SFFS 2236 / HPP553 / A&M363 / GtG401 / G(II)539 / GC839 / GC(II)743 / G(3)848 / CP465 / W&R649 / Cha284 / SP175 / URW054 / Lau475 Here in this place new light is streaming / Gather us in (Haugen). Excellent words, very well known. “Nourish us well and teach us to fashion lives that are holy and hearts that are true”. Lyrics and lead sheet. *TiS 178 / G(II)335 / GC478 / GC(II)487 Praise the God who changes places I like the joy of the tune written by William Rowan (BOE) for this song. Lyrics and sign language here (scroll to the bottom for the lyrics). Sample here, to a different tune. The promise of the Spirit; Peace I leave with you. *ATW 494 For you deep stillness Mann/Perrin. This homegrown favourite is just excellent. Lyrics and mp3 sample. Might be nice to sing this at the end of the service. AA126 / STB222 / StF396 Spirit who broods (Shirley Murray) Good repetitive words, to a soothing Taiwanese tune (in STB) or a lilting waltz (in StF). *URW066 Holy Spirit wind of heaven (Garnaas-Holmes) Terrific words sung to the familiar tune ODE TO JOY. "Holy Spirit, Wind of Heaven, Breath of Life, our warmth and light". TiS 687 God gives us a future (Smith) Great words to a very easy hymn tune. Careful not to let it get the tune get too pompous; the words are not! "God gives us a future, daring us to go into dreams and dangers on a path unknown. We will face tomorrow in the Spirit's power, we will let God change us for new life starts now!". Lyrics here (scroll down). 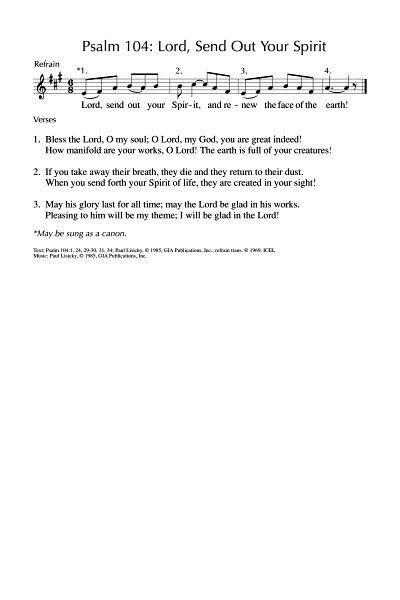 Notice how the hymn has been split into two parts to include the blessing and words of mission. New words to old tunes. TiS 412 / AHB 324 / ATE 251 / G(II)328 / GC468 / CP651 / W&R130 God sends us the Spirit to befriend and help us / Spirit Friend I like this song from Malawi, but the lack of inclusive language for God sometimes drives me a bit crazy. In Tom Colvin's book "Come Let us walk this road together" he uses more inclusive language than many hymnals. That is, he writes “God sends us the Spirit” instead of “God sends us His Spirit” and "Spirit of our Maker" rather than “Spirit of our Father”. Less inclusive lyrics and a strange sound sample. CH344 / FFS01 / W&R635 And Jesus said (Murray/Jillian Bray) Great words. Tune is a bit tricky. NCH249 / GA517 Peace I leave with you my friends (Norbert) Slow, simple and excellent words. A congregation will pick this up the first time through, I think. We've had great success with Spirit Of God. Holy Spirit, living breath of God - Townend/Getty - beautiful.